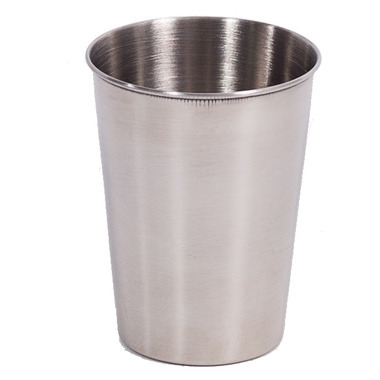 The Onyx 9 oz Tumbler Cup is a stainless steel cup with a smooth rolled lip. Perfect size for little hands, and no fear of broken glass when dropped! Great cups. My 3 year old son loves them. Very easy for him to hold and use without spilling. We will be ordering more soon. Awesome product. Great non-plastic cups for kids or adults. And we'll have them forever. Love it! Perfeft for little hands, smooth and light weight. My son likes how shiny it is. I highly recommend this cup. I really love these, the quality is good and they are perfect cups for children. No plastic, no breakage! Perfect size for the kids or myself. Perfect alternative to plastic especially for kids. You don't have to worry about them breaking it. Very smooth and shiny. Highly recommended! Great size for all the family, very smooth material, clean up nice and shiny. Metal is smooth, washes well in dishwasher. Great size for kids and self. Much preferred over plastic alternatives. Love these tumblers. Just the right size for my toddler's hands, and we use the Sip-snap silicone tops with these. We are avoiding plastic, these fit the bill. They come out of the dishwasher looking great. I'm so thankful for the Well.ca email notifications when out-of-stock items are back in stock, because I waited for these are I'm very happy with them.